Hello everybody, and welcome to another edition of Feature Beer Friday! No blind side by side tasting this week (will come back to that idea though for sure) but I did recently pick up a few beers from Rahr & Sons Brewing Company out of Fort Worth, TX, and anytime I see a new brewery (to me at least) in our market I think it's worthy of a little exploration. As I just mentioned, Rahr & Sons hails from Fort Worth, TX, having opened in 2004 before the craft beer movement really exploded. 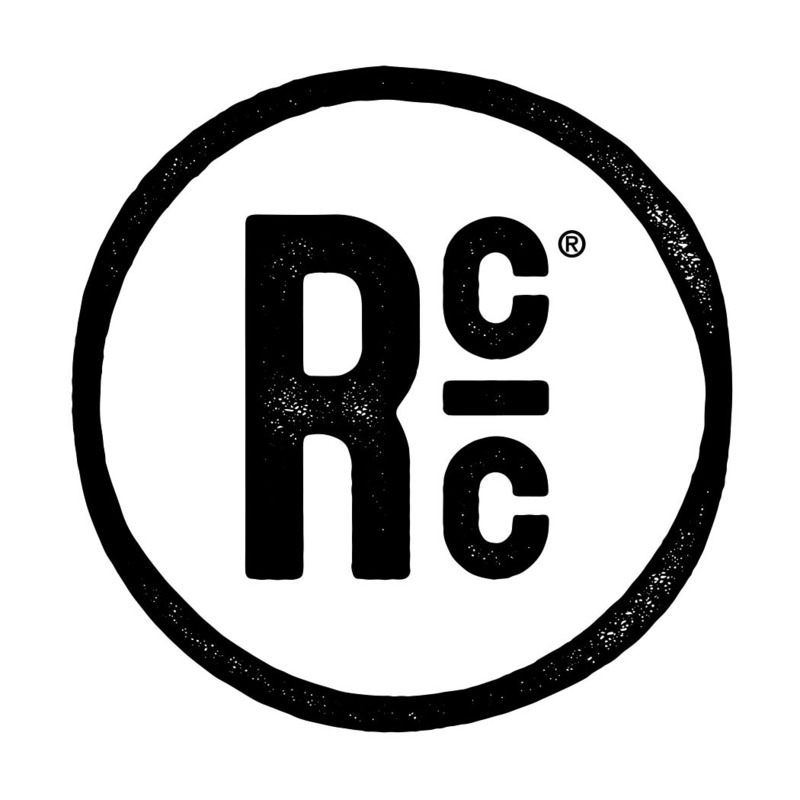 Those of you that dabble in brewing, on the homebrew scale or larger, might know the name "Rahr" from the Rahr Malting Company, which supplies malted barley to breweries across the country. Rahr & Sons Brewing was founded by the great great grandson of William Rahr, the founder of the Rahr Malting Company and Eagle Brewing Company, so brewing is definitely part of the family history. Tragically, William Rahr died from burns he suffered due to falling into a brew kettle during an inspection of his brewery in 1880. Let that be a less to all homebrewers and commercial brewers alike, safety is important! 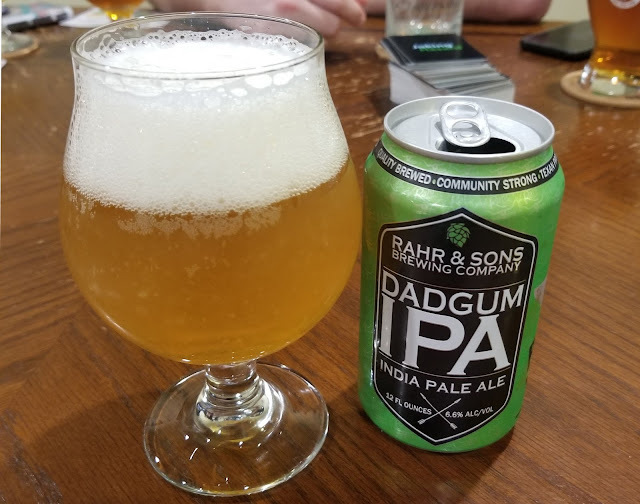 This week's selection is their flagship Dadgum IPA, 6.6% abv and charged with citra and lemondrop hops. It's a deep golden color, very little haze, with a bubbly white head that lingers for a while. I find the aroma to be quite bitter, with notes of pine and lemon and a little grainy sweetness. The flavor is hoppy with a medium bitterness, pine notes still come through as well as more citrus, and there's a definite malty base to support the IBUs. This is certainly a departure from the haze craze, with a strong lingering bitter finish. I'll have no problem finishing off this 6-pack, and if you are looking for a bit of a throwback IPA, this one might in your wheelhouse. If you're wanting more and more dry hops and haze, this isn't the beer you are looking for. One thing is for sure though, there is plenty of room in my fridge for both. Cheers! 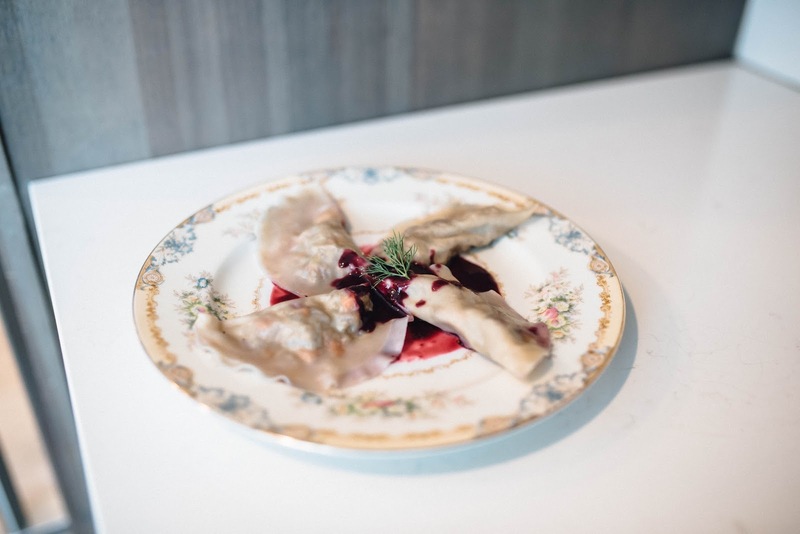 These dumplings make an excellent appetizer with a pop of color. You can stuff a dumpling with a plethora of fillings; dumplings are delicious. I chose duck and leek because they pair very well together. The fat from the duck and the acidity from the leek create a great balance. An alternative way to get some color on them is to poach them or quickly sear in a hot skillet. Take skin off duck breasts and place skin into skillet. Turn heat to low and allow for skin to fully render fat (this may take a while). Once fat has rendered, discard skin, but keep the fat. Add small diced duck breasts, shallots, carrots, celery and garlic to skillet with duck fat. Cook until vegetables are soft, duck is cooked and there is no liquid left in skillet. Set aside and allow to cool. Whisk 1 egg and 1 Tbs of water. Set aside to be used for egg wash for dumplings. Put wonton wrapper down so one corner is pointing towards the top (diamond-shaped) and brush along edges with egg wash. Place 1 Tbs of filling in the middle and take the bottom corner to meet the top corner to form a triangle. Seal on all three sides and brush with egg wash. In a saucepot, bring water to a simmer. Poach dumplings until dough is soft. To make the blueberry sauce, combine blueberries, Jay D’s Blanc du Bois, honey and salt in a saucepan and bring to boil. Simmer for about 15 minutes until thickened and reduced by half. Serve over dumplings or as a dipping sauce. Good morning everyone! 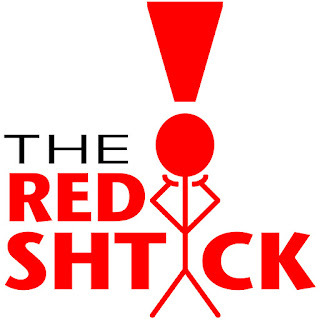 This week I'm going for a bit of a departure from the standard review. I happened to have two Louisiana brewed blonde beers (one ale and one lager) in the fridge, so I figured this was the perfect chance for a little side by side blind taste test. I had my lovely wife Mandi pour the pair of beers into identically sized glasses and bring them out without me knowing which beer was which. In one corner glass: Tin Roof Brewing's Blonde Ale, hailing from Baton Rouge, 5% abv and 15 IBU. In the other corner glass: Flying Tiger Brewery's Burma Blonde, a blonde lager from Monroe, 5.1% abv and 19 IBU. Now there's no way I (or anyone) is going to notice the .1% abv difference, and I probably won't even be able to notice the slight difference in IBU especially considering both of these beers rely on Glacier hops, but I figured that I could probably pick up the differences in flavor imparted by the yeast strains. No promises though, that's for sure. Two mystery beers... at this point I didn't know which was which. 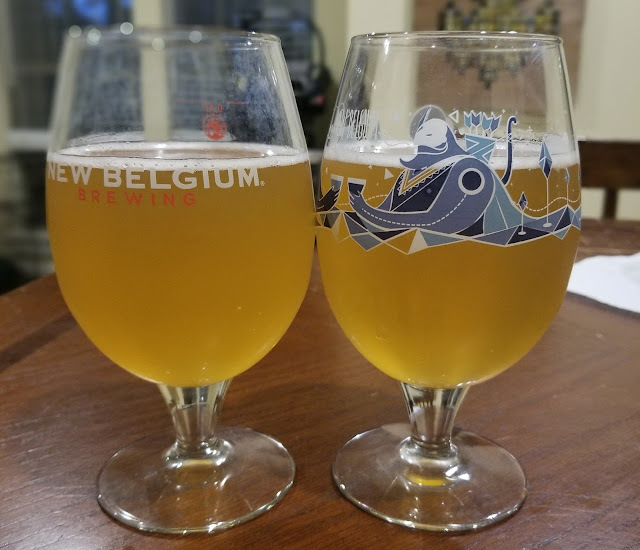 After receiving the two beers, both in New Belgium glasses (which are my favorite) it became obvious that there was no was to really tell them apart based on appearance. Both beers had about the same exact golden tint and fairly equal levels of opaqueness. On the aroma, the beer on the left had a very clean crisp aroma with just a hint of grainy sweetness, while the right had a similar crispness with just a hint of sulfuric flavor. Both beers tasted quite refreshing, with the only difference again being a slight sulfuric flavor on the right beer that caused me to give the edge, slightly, to the beer on the left. With that in mind I cast my vote to the beer on the left and Mandi revealed that that one was the Tin Roof Blonde. Honestly these two beers are extremely comparable, and I had no problem crushing both and could easily see myself drinking plenty of either of them as the weather heats up in South Louisiana. 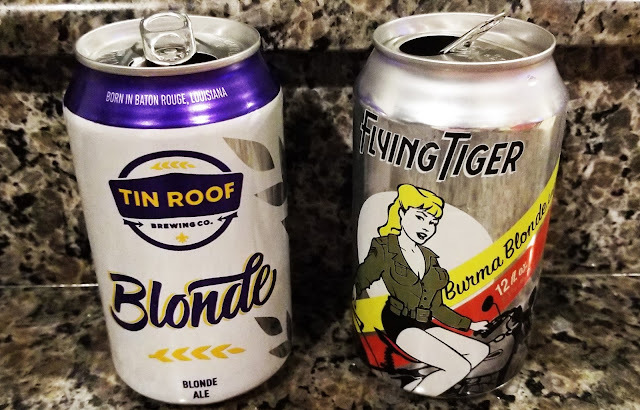 While I did lean toward the Tin Roof Blonde, if someone asks me which one to pick, I'd say to support your local brewery. You can't go wrong either way. The Gulf of Mexico produces some of the world’s best oysters, so it was a no-brainer for this round of recipe development. 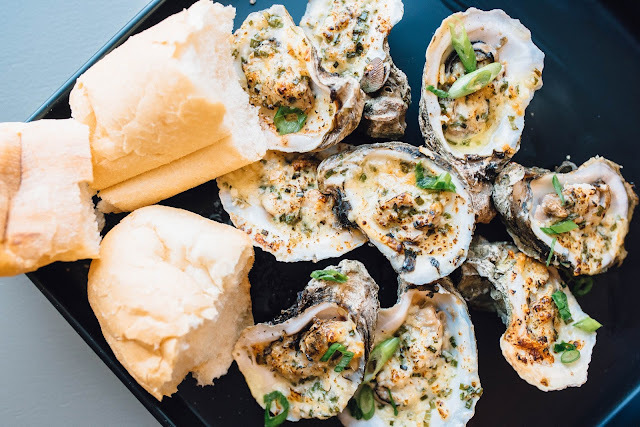 I picked out a dozen beautiful oysters from a local seafood market, Tony’s Seafood and made a simple wine butter featuring Jay D’s Blanc du Bois that complemented the natural flavor of the oysters. Simple, delicious, and quite the treat! Allow butter to soften and combine with parmesan, chives, Jay D’s Blanc du Bois and garlic. Mix very well then put in fridge to harden. Shuck oysters and leave on half shell. Add 1 tablespoon of butter to each oyster and grill or broil until butter is bubbly and slightly browned. Ok everyone settle down. I know what you’re saying after reading that title. A hamburger pizza doesn’t qualify as a “burger” Chuck. You’re probably thinking I’ve lost my damn mind. Well folks, let me tell you about the Burger Pizza at the new Rotolo’s Craft & Crust. First off let’s make it very clear. This is not your standard hamburger pizza by any means. This incredible concoction created by Mitch Rotolo Jr. is a pie straight out of my dreams. A perfect vision of combining two of my favorite foods into one gloriously delicious meal. Like, seriously. Looking at that picture has me craving one right now! Let’s talk toppings. It’s pretty much everything you’d throw onto a standard burger. It’s got a mustard base, ground beef, grilled onions, mozzarella and is topped off with pickles and french fries-- French fries, people! I mean come on man! If that’s not a straight up burger pizza then I don’t know what is. Taste-wise, it is completely spot on. Imagine it as if you’d taken the top bun off of your burger and ate it that way. Granted, no one really does that, I’m just trying to make a comparison. If I had one recommendation I would do like a Thousand Island dressing drizzle on it which would give it almost a Big Mac kinda feel or maybe even a garlic aioli or any type of sauce you’d normally add to your burger. And also bacon... LOTS OF BACON. This was a trial run that our Bite & Booze team got to try , so it’s not available to the masses just yet. 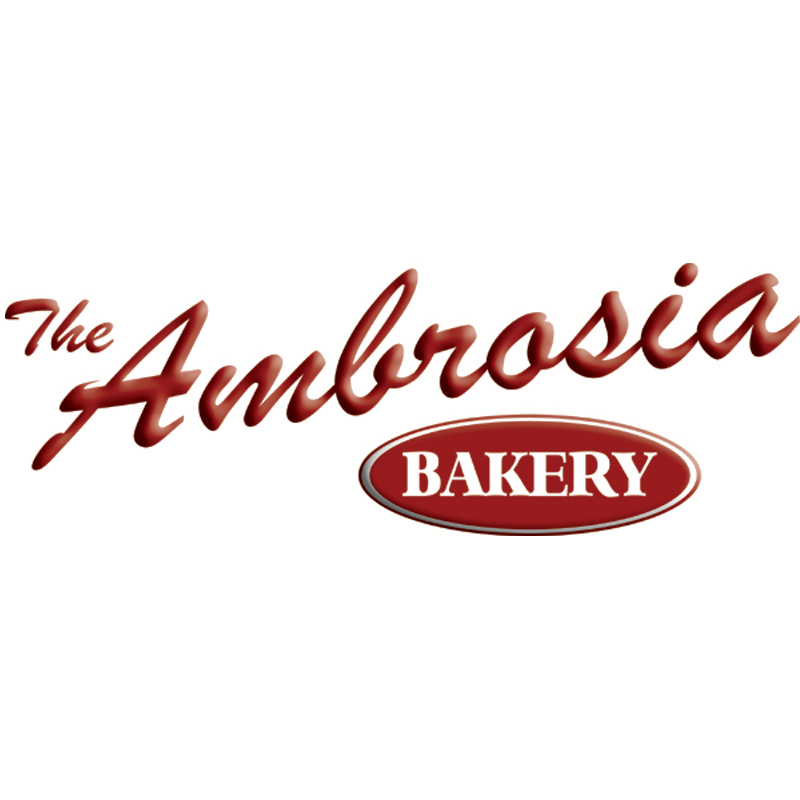 We were told that it would either be added to the menu full time soon or served as a special once they were completely satisfied with their final recipe. Make sure you’re following Rotolo’s Craft & Crust on Facebook and Instagram to find out when the Burger Pizza will be available as well all future specialty pies to come. Good morning everyone! Today is a big day around Baton Rouge (if the weather doesn't screw us over) with a few of my favorite festivals taking place. Kicking off downtown today (and continuing tomorrow) is the Baton Rouge Blues Festival, and over at LSU's Rural Life Museum you can find the Zapp's International Beer Festival. I've been attending both events pretty regularly over the years, and it's a little (okay, a lot) disappointing that both are starting at roughly the same time, but the good news is that there is plenty of time this weekend to do both if you choose! That's certainly my plan. 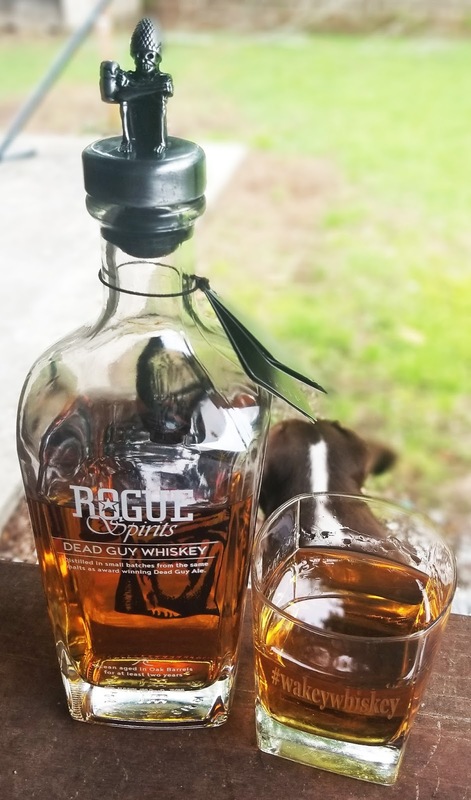 With a beer festival on my minds, I figured it would be the perfect time to try out a whiskey created by a company primarily known as a brewery, the Rogue Spirits Dead Guy Whiskey. I'm sure most of you out there have heard of Rogue Ales, an Oregon-based brewery that has been around for years with beers like the Dead Guy Ale and Hazelnut Brown. Well, they also have their very own distillery in Newport, Oregon where they create three different whiskeys and two types of gin. The Dead Guy Whiskey is made from the same malted barley combination that comprised the malt bill on their Dead Guy Ale, primarily 2-Row with some Munich, Crystal 15, and a couple of locally grown malts as well. This might seem like a departure from American whiskeys which use primarily corn but also wheat and rye, but distilling from a mash of malted barley is extremely common in Scotland and Ireland. Malted barley is used almost exclusively in the production of both Scotch whisky and Irish whiskey, so with that in mind, I expected some similarities with those spirits in this offering from Rogue. The Dead Guy Whiskey is then aged in oak barrels for at least two years in barrels exposed to the ocean. Their barrel aging facility in Newport is exposed to the saltwater in a similar manner to the Lagavulin aging warehouse in Islay, Scotland. I'll be honest before getting into the review... I'm not a huge fan of Rogue beers, and I've tried a rum from them in the past that I thought was outright awful, so my expectation going into this one were pretty low. That said, I'm always willing to give a beverage a chance, and the idea behind this one had a lot of promise, so I poured pretty heavy anyway. The color is excellent, which was apparent before the pour, a deep amber that appears more rich than the two years of aging... perhaps this was a second use barrel or smaller barrel? The aroma is much more like a lighter Scotch to me, with a bit of honey, some citrus, some floral notes, and a very pleasant alcohol character. The taste is more of the honey note, with some vanilla oak character from the barrel aging, with maybe a hint of saltiness, but I certainly don't get the "ocean aging" on this one like I do in a bottle of Lagavulin or Jefferson's Ocean. I'd bet that a few more years could really change this one for the better with the ocean aging they are going for. It's really smooth though, very easy to drink with some extremely pleasant Scotch notes that remind me of a good Speyside single malt. I was seriously impressed with this whiskey, complex refreshing flavors that kept my attention throughout the pour. This is definitely worth a purchase if you see it out in the wild! Hello everyone, and welcome to another edition of Feature Beer Friday! We're staying in-state this week with an offering from Flying Tiger Brewery out of Monroe. This is one of the handful of Louisiana breweries that I haven't yet had a chance to visit, and in fact I don't think I've ever even been to Monroe. I certainly don't remember ever visiting, and that's something that I'll have to change eventually... and when I do, a visit to the Flying Tiger taproom will certainly be in order. Flying Tiger Brewery (not to be confused with Flying Heart or Crying Eagle) takes their name from the Flying Tigers, a volunteer group of American pilots who defended China against Japan during World War II. They were commanded by General Claire Chennault, who grew up in small Louisiana towns near Monroe. 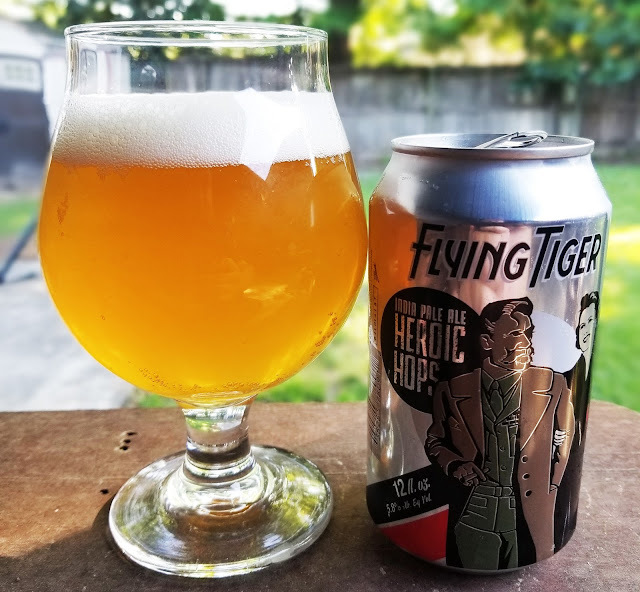 Heroic Hops is one of four flagship brews produced by Flying Tiger, in addition to a rotating lineup of seasonal and specialty brews in their taproom. The Man At Arms Amber Ale, Burma Blonde, and Warhawk Kolsch (a ULM affiliated beer) round out their flagship offerings. Heroic Hops comes in at 5.8% ABV and 69 IBU, right in the wheelhouse for an American IPA. They describe the beer as, "Citrus, Sauvignon grape, and tropical notes fly forward as these hops blend effortlessly with a strong base of two row and Munich malts. Let there be no mistake, heroism is definitive…as is the beer you drink." My first impression on pouring this beer is that it's hazier than I expected... I was expecting more of a traditional IPA look to this one but it's got a good bit of turbidity going on. I'm not saying it's as hazy as last week's Jucifer, but it's certainly not a filtered clear IPA either. The color is gold-to-amber, with a bubbly white champagne-esque head. The aroma is definitely strong with the sauvignon grape notes they described. I don't know if I would have picked that out without the description, but now that it's in my head, it's all I can think of when I smell this beer. There are definitely hints of citrus as well, but the sauvignon notes dominate in my opinion. The taste is a great follow through on the inviting aroma, with a fantastic balance of bitterness of tropical flavor, and the malt smartly stays out of the way to let the hops shine. All in all, this one really impressed me. I had only tried a few beers from Flying Tiger before, and wasn't sure what to expect from this IPA, but it has all the makings of a fantastic Summer weather back patio beer. Unfortunately this one isn't available in Baton Rouge yet, but next time you are up in North Louisiana, grab some, and bring a 6-pack down for me! Are you trying to reduce your meat consumption? Looking for some meal ideas that aren’t salad or just super bland? Well you are in luck. Because this Barbecue Buddha Bowl is probably one of the most satisfying meals! The combination of complex carbohydrates from the rice and sweet potato, the high protein content of tofu, plus the vitamins and minerals coming from the leafy greens and tahini dressing creates a well-balanced meal that isn’t a compromise on flavor! Jay D’s Louisiana Barbecue Sauce adds that sweet and salty barbecue coat over the tofu, you won’t even miss the meat! Try this out on your next “Meatless Monday,” or make it like, every day… it’s just that good! Press tofu for 15-20 minutes to remove excess liquid. Place tofu on a flat pan lined with parchment paper and do the same for the sweet potato cubes. While the tofu and potatoes are baking, whisk together the tahini, lemon juice, water and sea salt to create a dressing for the greens. After tofu and potatoes are finished, scoop out 1 cup of cooked brown rice into 2 separate bowls. Slice the ½ of an avocado into ¼ into cubes or thin slices. On top of rice, scoop out ½ of the baked BBQ tofu, ½ of the baked sweet potato, ½ cup of greens drizzled with ½ of the dressing, ¼ of an avocado - into each bowl for a completely satisfying meal! Good morning everyone, and welcome to another riveting installment of Feature Beer Friday here at Bite and Booze. I'm going to keep trying to feature a mix of local, regional, national, and possibly even international brews in this space, but naturally being in Baton Rouge my beer fridge is going to contain more locally available brews than not. The good news in that regard is that there are no shortage of Louisiana breweries putting out some excellent brews. With that in mind, this week's offering is coming to you from Gnarly Barley Brewing just down I-12 in Hammond. Gnarly Barley was established in 2014 by husband and wife team Zac and Cari Caramonta. Like many brewers before and since, they got their start homebrewing before turning their passion into a full blown business. Currently the brewery is open for tastings on Fridays from 5 to 9 and on Saturdays from 12 to 5. If you are ever looking for something to do on those days, it's easily worth the short drive to Hammond, but of course drive responsibly. Today's offering from Gnarly Barley is the Jucifer IPA, their take on the extremely popular hazy "New England" IPA style, or just NEIPA for short. The style is finally recognized by the BJCP as it's own distinct type of specialty IPA, and the impression is described as: "A refreshing hop-driven pale ale showcasing fresh, juicy, fruity hop flavors and aromas. Moderate bitterness and low malt flavors only play a supporting role, preserving approachable drinkability. Deceptively soft, creamy mouthfeel gives way to a crisp, dry finish characteristic of all American IPA’s. Singularly hazy but still attractive to those who appreciate an intense hop experience." 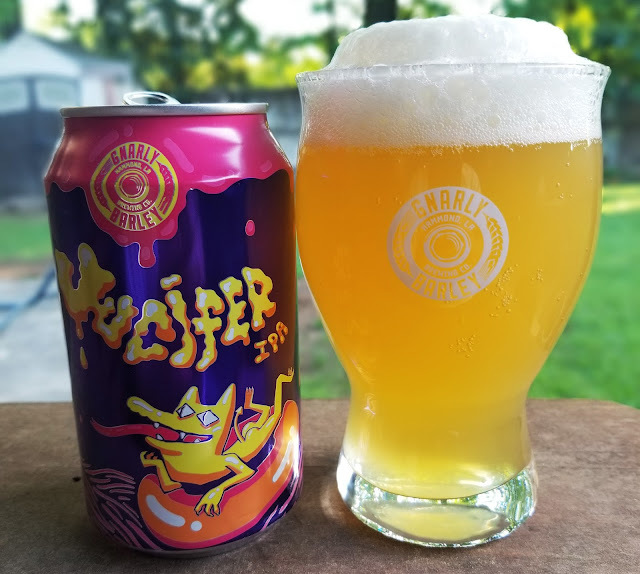 Jucifer comes in at 6% abv and 79.5 IBU, and pours a hazy bright golden color that's perfect for the style, with a frothy white head that lingers for minutes. The aroma is strong with grapefruit and blood orange, in my opinion, strong citrus flavors with a hint of tropical tones. The taste is more of the same, with an excellent blend of citrus and tropical flavors with just the right amount of underlying bitterness to accentuate the hops but prevent a harsh acerbic finish. At 6% this is a smooth easy drinker that will always have a place in my beer fridge. Easy to eat, and a crowd favorite, these pork and cabbage egg rolls are a spin on the classic European dish, cabbage rolls. 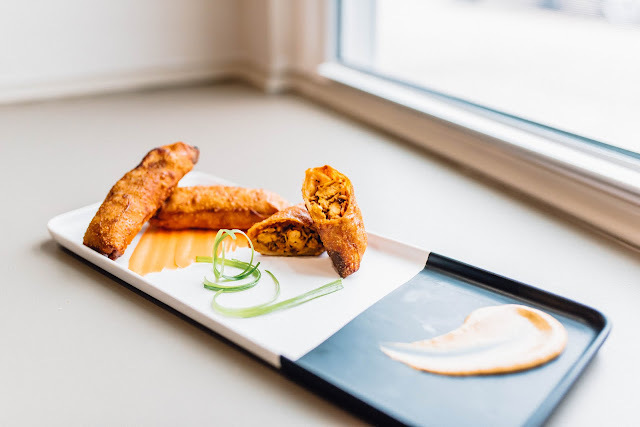 Using ground pork and cabbage along with Jay D’s Spicy & Sweet Rub, this eggroll packs a punch of flavor. The Jay D’s Louisiana Molasses Mustard mixed with sour cream adds a nice tang. Heat canola oil to 350℉ in a skillet. In another skillet, brown ground pork. Add carrots, onions, and garlic, then saute until soft. Add Jay D’s Spicy & Sweet Rub, tomato sauce and salt. Cook for 6 minutes, then set aside to cool. Take an egg roll wrap and brush each side with egg wash. Place 2 tablespoons of filling on wrapper and fold up the corner. Fold the left and right corners into the middle and continue to roll. Fry both sides of egg roll until golden brown and delicious. Serve with molasses mustard sour cream.